This is a subject that is near and dear to my heart, I truly believe that to find more of who we are we need to look to our past. Those people who deposited a bit of DNA to make us who we are. I am a genealogical addict, my imagination roams as I find new names and peek at what little documentation was left by my ancestors. I try to picture how they lived, where they happy? miserable? did they worry about their children as I worry about mine? Much of my family settled in around northern/central New England and Eastern Canadian provinces. My maternal grandfather's family have lived for at least 1,000 years on or near the sea. Now, coming from a line of people who have this inexplicable passion for the ocean I like to think that this explains why. Most of the other half are/were farmers closely tied to the Earth and her rhythms. From there I can see why I embrace my Pagan leanings, it's deeply ingrained from generations of those who held such a reverence for Nature. Uncovering your family tree can give you a sense of where you came from, what blood flows through your veins, is it noble? peasant? blood of heroes? convicts? It is truly a fascinating journey sometimes filled with outrageous stories. I have yet to find any skeletons in our closet but I keep hoping! An fyi for those new to family history research, many of the families who settled in the US during the pre-Colonial and Colonial times frequently have direct lineage to English and European royal bloodlines, usually through the outcasts or younger siblings of the Kings and Queens across the pond. You can google "genealogy" for tons of other sites. Ancestry.com no longer shares as much as they used to. First rule of thumb is to verify, verify, verify. Just because it is written on any of the sites does not necessarily make it so. For example, I have unofficially traced one of my family lines back to pre-Roman invasion England (and Italy) and through that I am 'supposedly' a distant granddaughter of the Iceni Queen Boudicca. Well, that is very exciting and once the thrill wore off I piled it into the 'need to verify' pile, aka "hahaha! in your dreams!" pile. It is a nice little fantasy, but in all actuality most likely that, a fantasy. Just remember, as you venture out into your genealogical "dig" one thing to remember is that anything dated pre-1500 to 1550 may be grossly inaccurate. I have learned that in one line of my family they bought their pedigree post-William the Conqueror to secure their place in more nobler circles, no one has uncovered their true origins as of yet. There are many sites to help you get started. I do recommend a Genealogy 101 course if at all possible. I found one at a local high school years ago and it provided the much needed basics to make research easier. Intuition is also a good tool to have I have found. Local vital statistics offices are an excellent source, if not in your town than in your state's capital city (if in US). Please note that most vital stats under 75 years in age will be subjected to a fee. What to do with the info you've found? I collect names and photos, I have a few possessions but very little. These items play an important part in my ancestral shrine (photo above). I use the top of the entertainment center in our living room for the big main shrine. On it one would find many photos of my ancestors, items belonging to them, a plate on which my daughter and I will leave seasonal and sometimes daily *offerings* from our walks. Flowers, seed pods, etc. I find that having the shrine above the TV causes me to stop and say hello and just look at the eyes and faces of my family. My maternal grandparents played a major part in my upbringing. My grandfather passed in 1989 and my grandmother passed 2002. I miss them terribly as they are for all intents and purpose my parents so it is a bittersweet moment when I stop to pass the time of day with them. (Yes, I have received odd looks but I feel better talking with them). Samhuinn is a time of remembering ancestors and a perfect time to bring out your family tree. Ceisiwr Serith, author of The Pagan Family describes a ritual of remembering ones ancestry on Samhuinn. At Samhuinn I use this ritual and name off everyone I can from memory, calling them to our feast. Our table is set and a nearby table holds the genealogy and belongings of my family. Lenoramoon shared a fantastic idea of making a Rememberance tree for Samhuinn which I first did a few years ago. 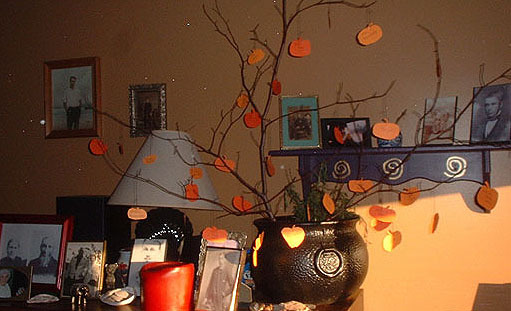 I found a fallen branch that looked like a small, bare tree and on colored paper cut in the shapes of pumpkins and apples I wrote the names of our family and friends who have passed, these shapes can be laminated and one could add crepe paper, lights, anything that strikes your fancy.